"This is a dish I put together for my son, Jordan, who is a huge fan of both tomatoes and mushrooms. The flavors keep blending together, so it is great the day you make it and even better the following day." 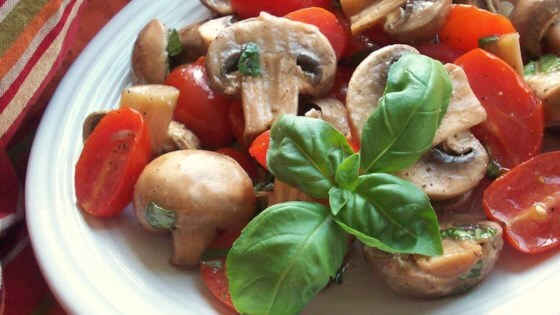 Whisk together the balsamic vinegar, vegetable oil, sugar, salt, and pepper in a bowl; add the tomatoes, mushrooms, onions, and basil; toss until evenly coated. Cover and chill in refrigerator at least 3 hours. Stir before serving. Sorry, followed the recipe exactly and it was not a hit. Made for a potluck and it was the only thing left at the end of the evening. A hit from SunnyB. I was unsure of it the day I made it but the next day it was PERFECTION. I would definatley made the day before. I used baby bellas and fresh basil. A definate keeper. Awesome recipe, great for when the cherry tomato plant is going crazy producing! I don't find the sugar neccessary for the dressing, especially when using super high quality balsamic.